I went to Target over the weekend and went immediately to the Target Dollar Spot. I have a small problem with that section meaning I spend 1/4 of my life in it. I found some fun items I immediately thought would be perfect for a Valentine’s DIY project. 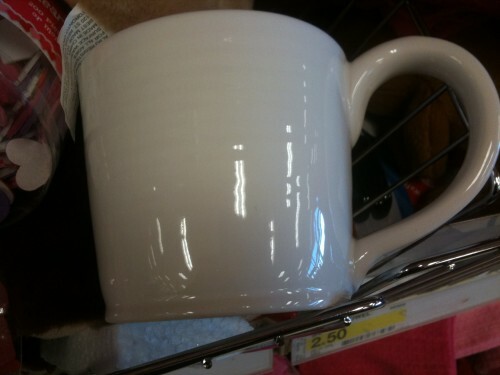 I saw this mug in Target’s Dollar Spot for $2.50. My mind immediately saw several cute projects I’ve seen pinned on Pinterest. These mugs remind me of some I have from Anthropolgie. Just buy a Porcelaine Paint Marker and draw the design on yourself. I’ve seen pens like this at Michaels too. You could spell out “L-O-V-E” or I love the idea of his and her mugs for Valentine’s Day. Speaking of His & Her mugs, aren’t these cute? I’m a little over mustaches in art but these mugs would be cute for me and my husband since he actually has a mustache (and beard) going for him. Other cute ideas I love include writing a favorite love quote, lyrics from a special song, or even drawing the skyline of the city you met on your mug. Stuff your mug full of gifts from someone you love or use it to serve up some breakfast in bed. The other item that caught my eye in the Target Dollar Spot was this silicone tray. It’s also $2.50. Target calls it a muffin tray so the obvious choice for it is making muffins. But I thought, why not pie? 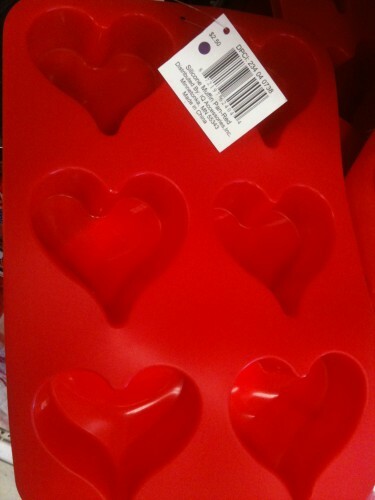 Heart shaped pies? I’m there. You could even go savory and make mini-heart-shaped pizza pies. My favorite idea isn’t as edible. If you have kids, what better way to combine holidays and clean-up than with these recycled heart crayons? It’s so practical and you can make all those little pieces become new again. I’m going cheap for Valentine’s this year so I was thrilled to see such cute finds. I still need to check out the local dollar store to see how well I can do there. Have you managed to dig up any finds in Target’s Dollar Spot or anywhere else thrifty lately?